This four wheel walking cart folds smaller into just 52 cubic inches for an easy fit in your car trunk and even better weights only 13 lbs while its low center of gravity creates great stability on slopes. This feature loaded cart needs only two motions to fold and unfold and has a latch that easily allows handle height adjustment. 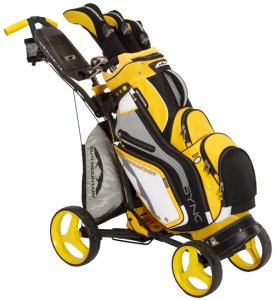 The four wheels come standard with low maintenance solid foam tires and an adjustable front axle to accommodate staff-sized golf bags. Micro-Cart has a lightweight anodized aluminum frame with handle-height positions, a strapless bag bracket, the Micro-Paq storage bag and a console with padded valuables tray, ball and tee holders, magnetic scorecard holder, and a drink holder. The standard Micro-Cart is available in four colors (red, black, blue and silver) and the new for 2013 Micro-Cart Sport is available in bold color combinations (black/yellow, charcoal/red, black/lime and charcoal/pink). Micro-Cart and Micro-Cart Sport are available now with a retail price of $189.